Training is necessary, but is it adequate in high-volume forklift operations or limited visibility areas? According to OSHA, training is the key to forklift safety, and there is fundamental agreement on that. Training can and does make a serious dent in the high injury rates suffered due to industrial traffic. Training must happen, and it must be repeated. But that begs this question: Why has training failed to move the needle when it comes to serious forklift related injuries? The numbers seem to have stabilized at an average of 100 deaths per year, and have stayed consistently at that level for years. While training the driver is non-negotiable, training and protecting non-drivers who work in the same space seems to receive less emphasis. It shouldn’t, since these are the people at risk for serious injuries – over 20,000 annually. Do the warehouse workers, pickers, packers, assemblers, and other employees who are frequently on the floor during a forklift shift receive training specific to forklifts and how they are expected to behave around them? Workers should wear brightly colored clothes such as safety vests to help drivers see them. 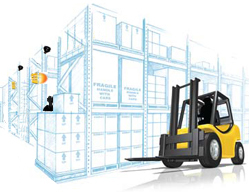 Utilize technology: install collision safety sensors, visibility gates, and advanced safety systems such as AisleCop® forklift safety gates to enhance worker protection, particularly in the least safe areas of your facility. Many companies are offering these kinds of safety assistance, and it is inexpensive relative to the cost of even one forklift/pedestrian accident. Explore the possibilities and try to find ways to automate parts of the safety process in your facility. Some aisles should be designated for forklift traffic only, while others should be designated for pedestrians only. This should be strictly enforced. Traffic management can be very simple to design and inexpensive to implement with minimal barrier and floor taping, along with a heavy dose of training for pedestrians and workers. Don’t forget: temps, vendors, truck drivers, salespeople, consultants, and other visitors also need to be educated about your traffic preferences before they enter your operation. Work cells should be guarded by bollards or heavy guard rails if they are in traffic areas. In some cases, the lift doesn’t need to strike the worker to cause a casualty. In a 1995 case, a forklift backed into a scrap metal bin, which smashed into a punch press operator. Guard rails are an inexpensive, visible way to help prevent these types of accidents. Never allow workers to ride along on a forklift. Teach workers never to stand behind a forklift, and to defer to it in every situation. Forklifts have inferior braking and handling characteristics that many pedestrians may not understand. Most importantly, be sure pedestrians are aware that their personal safety is ultimately in their hands, and that they have the most to lose in an accident. Working in a mixed traffic area can be dangerous, but if people are aware, if safety procedures are implemented, and if they are followed, the chances of a terrible accident (with forklifts and pedestrians there is no other kind) can be reduced. Ultimately you have to train your people about the safe way to interact with and work around industrial traffic (which includes everything from AGV’s to walkies as well as forklifts), but you can’t leave it at that. When most forklifts in operation will eventually be involved in an accident at least one time, and when 36% of those accidents involve a pedestrian, training is not enough. Looking at motion detection technology, traffic management, and other preventative measures can mean the difference between a crippling or lethal accident and safer operation.